Israel - The Education Ministry should “seriously consider” regional school assignments for ultra-Orthodox schools to prevent discrimination, the head of the Knesset Education Committee, MK Ya’acov Margi (Shas), recommended at a committee meeting on Tuesday. Israel Porush, the mayor of Elad, spoke briefly at the meeting but the legal adviser to the committee said the specific case of Elad must not be discussed because of a pending lawsuit on the matter that is being dealt with by the courts. Margi demanded that the Education Ministry prepare guidelines for acceptance into the ultra-Orthodox school system and asked the ministry to provide the committee with a document mapping out the building needs in Elad. In addition, Margi called on Porush and representatives from the Education Ministry to work together to find an immediate solution for students in Elad who are still waiting for school assignments for the upcoming year and asked for a report within a week. Yoav Laloum, chairman of the Noar Kehalacha organization, which fights discrimination and promotes basic rights in the country’s ultra-Orthodox communities, also was present at the meeting and said the system was working “like in Chelm” and needed to undergo a significant change. In a conversation with The Jerusalem Post on Wednesday, Laloum explained that the main problem this year is in Elad, where 120 girls are still waiting to be accepted into high schools where studies are slated to begin on the fast-approaching September 1. Outside of Elad, in places like Jerusalem and Betar Illit, the problem is much smaller, affecting between five and 15 girls in each city, he said. “In contrast to previous years, the number of girls who were not assigned [a place in a school]... it’s relatively small. If in previous years we would have spoken about hundreds, and almost 1,000 from around the country who on the first of [September] didn’t know where they were going to school, in the past few years we are talking about close to zero…” he said. In previous years, he said, principals would plainly say a Sephardi girl was not wanted in their schools. Today, he said, they make excuses such as not pass - ing the interview, which makes it more difficult to deal with. Laloum explained that for girls, there are mixed Lithuanian-Sephardi schools or those that are Sephardi only, but the latter are perceived as being not as good as the former. “They want to learn in the mixed schools. They don’t want to learn in a Sephardi ghetto. There are implications in the seminaries for future learning and for a shidduch , there are a lot of consequences,” he said of the choice between the schools. Laloum stated that discrimination does not only revolve around ethnicity, but also around issues like having parents who work, a family member who served in the army and political affiliation. “It affects the boys, too, but the issue with the boys is much more complicated,” said Laloum. “The parents’ fear of turning to the Education Ministry about the boys is much more complicated because the schools are more private and it is easier for them to do whatever they want. Anyone who attempts to mess with the principals of the boys’ institutions pays a much heavier price,” said Laloum. Laloum suggested two possible solutions for the problem. The first is that which Margi recommended the Education Ministry investigate – making the schools regional so they automatically accept those in their areas. The other is linking elementary schools with high schools, so the high schools automatically accept all the students from certain elementary schools. The key, he said, is not to allow principals a say in the matter. The whole situation is both sad and pathetic. What difference does it make if someone is a Sfardi or Ashkenazi? When these children are friends, it enriches all their lives. They are all Jews. All these school administrators, who do these things, should be fired. That includes discrimination against children whose fathers...am I allowed to say a four letter word?..... work. What has our people become? They will all have to answer for their actions. Where I live, our Shul has both Ashkenazi and Sfardi people as does the schools. Everyone lives side by side and gets along just fine. I don't understand how people can accept living in communities that discriminate like that, especially against children. Shame on them! no one is "Frum Enough". They are driven by the obsessions with sniut, shiddachim, avoiding army and work. Now they are feeding on each other. This is the Holy Land? I would rather live in LA as a decent human being. “ The whole situation is both sad and pathetic. What difference does it make if someone is a Sfardi or Ashkenazi? When these children are friends, it enriches all their lives. They are all Jews. All these school administrators, who do these things, should be fired. That includes discrimination against children whose fathers...am I allowed to say a four letter word?..... work. It's sad and pathetic because you only know one side of the story. For your information, Ashkenazic schools include about 35% Sephardim. 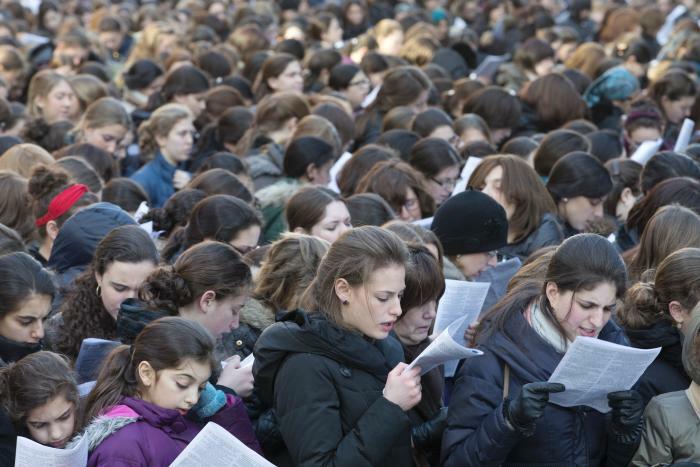 Girls who do not conform to the tzniut rules of the schools, whether they're Sephardim or Ashkenazim, are not accepted. Period. Most of them are Sephardim. Simple answer: Put these racist Litvish rabbonim and askanim in jail if there is any evidence there schools have deliberately denied admission to a girl from a Sephardeshe family while accepting additional Litvish girls. They take public funds and are obligated not to discriminate based on their subjective evaluation of who is "frum enough" or whose family has the "proper hashkafah". If there is a real shortage of classroom space, the parents should place their girls in public schools at the start of the school year while the required new classrooms are added so that they not miss one day of instruction. It's not simply Ashkenazi vs Sefardi discrimination. There may be discrimination against sefardim, but it isn't that simple. It's discriminating against a lifestyle. I was involved with sfardim for many years. Their lifestyle is one which when practiced by ashkenazim is also rejected. Take a sefardi family that was rejected and remove the label; take an ashkenazi family and do the same. check the details of the family lifestyle and the sefardi family will be rejected. I am Ashkenaz, but I would be rejected by these same schools that reject the sefardim. Are the standards used by these schools to choose who they accept logical or normal? NO! It's an extremest lifestyle, that in so many ways violates halacha, that these "chareidim" follow that causes this, but it's not anti-sefardi discrimination. This is not the answer. All should be accepted no matter what they are. The yeshiva should not be donated to until all the girls are placed!! They do not deserve a dime!! Finally a report on the Tzoros some parents experience when trying to get their child into a school !!!! The article should have mentioned the situation here in the U.S .,as well .Its a shame the names of those Yeshivos can't be listed . Nice of you to make things up. Tznius what not the reason sited here and schools have dress codes. There has long been a pattern of discrimination by Chareidi Ashkenazim against Chareidi Sfardim, since they are considered inferior. Before you make up other nonsense, I am Ashkenazi, not Sfardi. The reality is that it shouldn't matter to any of us where another Jew is from. We are all supposed to be family. I also think that it demonstrates a lot of chutzpah too. From what I've seen, Sfardim are generally much more spiritual than us and while they lived in a less sophisticated culture, as if that made it better for us, they were closer to the source than we were and it is likely that their minhagim are more authentic than ours. This is not the first issue like this. There have been many and you can't site a phony reason of Tznius, since as the article says itself says otherwise. Go look at what the Mayor, Israel Porush, said in the article. Elad is also the same location where children were denied entrance to school because their fathers have the chutzpah to work. So many boys and girls are OFF THE DERECH because they were NOT ACCEPTED by Yeshivas.May Hashem have mercy on ALL those"rejects"kids. I have heard that schools in NY have quotas for how many sefardic girls can be accepted. Now that is discrimination, and has nothing to do with the length of skirt. “ It's not simply Ashkenazi vs Sefardi discrimination. There may be discrimination against sefardim, but it isn't that simple. It's discriminating against a lifestyle. I beg to differ. It has nothing to do with a lifestyle, and your presumption that all sefaradim have a certain "lifestyle" is part of the problem. If you call the school with a sefardi name, there is no room left, and if you call with an ashkenazi name, you get an interview. Has nothing to do with level of frumkite or lifestyle. The discrimination against sefaradim is sad and sick, and goes on not only in Israel but in NY as well, and it has Nothing to do with frumness. I could not believe it until I saw it for myself. They also discriminate if they think you may need financial aid. I have seen sefardim from rich communities, who are not "frum enough" get accepted easier! There is nothing Jewish about the discrimination, but sadly there are no other "good schools" to send your kids to. I pray that they do put laws in effect that would prevent the discrimination in Israel and US. Sadly we don't have anyone within the "orthodox" world that would stand up against the discrimination. “ Nice of you to make things up. Tznius what not the reason sited here and schools have dress codes. You should verify things you say before attacking others. For your information #6 is not making things up. It is a fact that in Israel girls who have a tznius problem will not be accepted, and it's true that about 1/3 of the girls in Israel's schools are Sephradim. managed to build their life elsewhere fare much better. You're going to tell us that over one hundred Chareidi girls in Elad, who happen to be Sfardi, all have a tznius problems? Do any Ashkenazi girls have tnius problems? You must be joking. What about denying Charedi girls entrance to school because their father's work. Wow, that's a crime!!! All it is, is a very sick society and has nothing to do with Torah. BTW, I didn't attack others, I just responded to them after they answered my post. Why didn't you say anything to them about "attacking me?" Besides, these schools have dress codes. This is an age old problem of discrimination of Jews who have different minhagim, because one group feels superior and believes the other one inferior. You made a claim with absolutely no proof. The Chareidi Mayor even said he was attacked when he tried to fix the problem. You are basically saying that these girls should be thrown to the wolves for absurd reasons. Maybe they all need to put on the Jewish version of the burka, but then again, you'd need to find another excuse. It's funny that both posts, #6 and 18 are Anonymous. It's probably the same person making believe that someone is defending their stupidity. Pathetic!